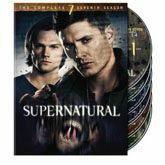 On September 18, the newest season of Supernatural came out on DVD and Bluray. The show stars Jensen Ackles and Jared Padalecki as Dean and Sam Winchester, brothers sworn to protect our world from the supernatural and paranormal beyond our comprehension. After having to deal with the literal forces of Heaven and Hell, the boys find themselves being tracked by demons and the like. The network put Season 7 out just in time for the shows’ 8th season to begin October 3, 2012 on the CW network.